Can you identify the jewels worn here by Diana, Princess of Wales in Chicago in 1996? We're still on hiatus from our normal weekly roundup of royal jewel news -- events are due to slowly start ramping up again next week, so fingers crossed that we'll have lots of sparkle and glitter to discuss then! 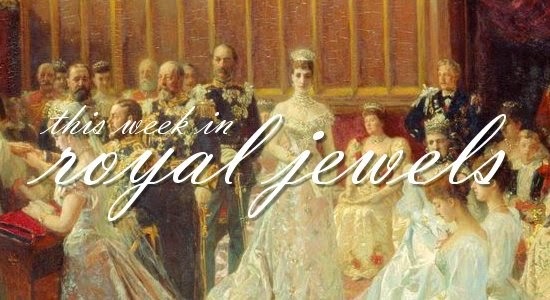 In the meantime, I thought you'd all enjoy a collection of stories about royal jewels that have been making the rounds this week. Happy reading! Dutch writer Eric Schoonhoven has posted new information about the magnificent sapphire and diamond tiara worn by Queen Máxima at her husband's inauguration in 2013. Although the piece was often attributed to Mellerio, maker of one of the family's ruby sets, Schoonhoven writes that gemologist George Hamel believes it was actually made by the Dutch jeweler Maison van der Stichel. It's movie day, class: grab some snacks, get comfy, and enjoy a bit of glittering royal video! Today we're featuring a 2007 episode of the CBC news series The Passionate Eye: "Princess Diana: Her Life in Jewels." The documentary features film of the late princess wearing her gems, plus interviews from journalists like Suzy Menkes. Alas, not every documentary feature is 100% accurate, and this one includes some mistakes amid all of the sparkling footage. Can you spot the errors? Let us know in the comments below! This time of year, a somber anniversary echoes in the minds of many royal watchers: that of the untimely and tragic death of Diana, Princess of Wales. Mother of one future king and grandmother of another, Diana's memory still looms large over the royal landscape. But while there are many sad chapters of Diana's story, today I thought it would be much more fun to survey some of the sparklier aspects of her royal life. Diana's last official engagement before her death was a trip to the Royal Albert Hall to see Swan Lake. For the performance, she wore a necklace that Garrard had designed with her input. Garrard later added matching earrings (never worn by Diana), also made of diamonds and pearls, to the necklace; the suite was sold after Diana's death to a private collector. "Czarist Jewels in Dazzling Array"
An Arabian Nights vision of the Romanoff treasure—the imperial crown jewels of Russia—diamonds as big as walnuts; rubies, emeralds, bright, blood-red or vivid green, large as a pigeon’s egg; pearls like nuts set in row after perfectly matched row; platinum, gold, and flashing diamonds shimmering like running water with the rainbow colors of a fountain in the sunlight. Over all and through all flash the diamonds, rose diamonds, black diamonds, thrilling and throbbing as if alive with inner flames: jewels of Golconda, jewels of Indian emperors for each of whose flashes gallons of human blood flowed like water, jewels of wars of dominion and triumph, jewels without price or equal in all the known world. And with that, all the romance of history and the strange secret fascination that gems hold for some in their squirming depths. No man can sense what is meant by the almost terrifically concentrated wealth you hold in your fingers, or the almost terror that grips your dazzled brain. Think of all that and now visualize the contrast. With Samuel Speewak, correspondent of The New York World, in the fifth year of the All Russia Soviet Federation of Socialist Republics, I saw them today in a high, bare, whitewashed room in what was formerly the new Moscow law courts. There are a dozen jewels that lie in the glass case. A big flat table with white paper in squares. Three workmen in gray smocks—pocket-less—one an expert in jewelry, and two officials—Begasheff, who heads the jewel commission, and Soboeof, the Secretary—and the two correspondents in plain sack suits. In the middle of the room is a big box of tested steel with the stamp of the crown of Imperial Russia on the cover, but secured by the red seals of the new Russia of the Soviets, of peasants and workmen. They lift from the chest a square wooden box and set it on the table. He puts a square foot of incandescent fire on the table. Diamonds, diamonds, and diamonds, with two rows of pearls over the middle milk-white iridescent. Above, a red stone, uncut but surmounted by a diamond cross. “Is it heavy?” asked one of the correspondents. “No,” said one of the workmen. “Five pounds at the most—try it,” and he placed it straightway on my head. It wasn’t heavy, but for the moment it felt as if the head were in a balloon into which gas was being pumped under pressure, and when a second later Speewak had the same experience, his face flushed dark, then went ivory pale. For this was the symbol of the world’s biggest white empire, the Imperial Crown of Catherine the Great, designed by Pauzie Mauer, jeweler of Geneva, and without peer in his art today. The curator in charge of the museum had discovered two pictures of this crown in chalk and charcoal by the Frenchman De Veilly, who was commissioned by Catherine to make a record—unfinished—of her treasures. For our final foray into Princess Anne's jewelry box this month, I've saved one of the best for last! Of the tiaras owned by Princess Anne, the diamond meander bandeau that belonged to her paternal grandmother, Princess Andrew of Greece and Denmark, has to be one of the most glamorous of all. Most of the tiaras in the British royal collection arrived in Windsor hands through members of Queen Elizabeth II’s family, especially Queen Alexandra, Queen Mary, and the Queen Mum. But today’s Mountbatten-Windsors trace half of their royal heritage to Greece, and this piece, the meander tiara that belonged to Prince Philip’s mother, is a part of that legacy. Can you identify the jewels worn here by the Princess of Sayn-Wittgenstein-Berleburg, née Princess Benedikte of Denmark, at a banquet at the Guildhall in London in 1995? One of the fanciest tiaras in the entire Dutch collection is the Württemberg Ornate Pearl Tiara. It makes sense, then, that so far this tiara (unlike most of the other Dutch sparklers) has only been worn by reigning queens. 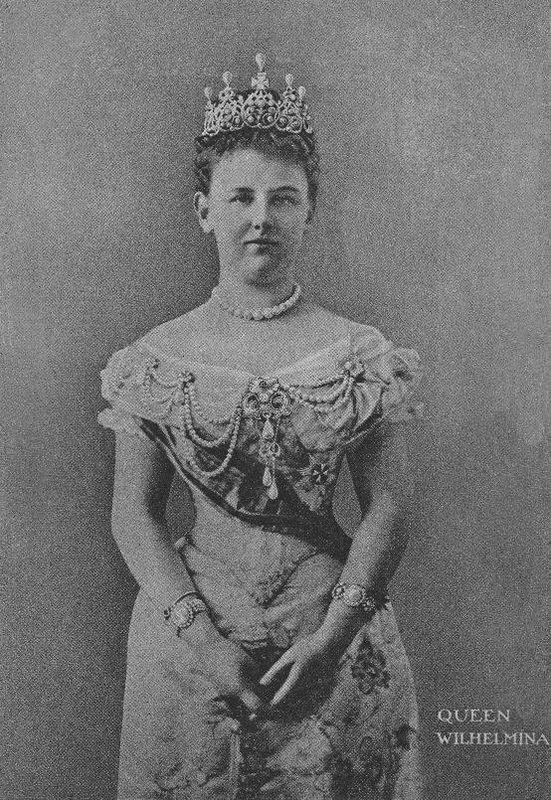 The tiara was almost certainly made by Schürmann for Queen Wilhelmina in 1897, a year before the young queen was enthroned. However, there’s a second provenance story for this piece floating around, too. That story suggests that the tiara is much older, made for Sophie of Württemberg (hence the tiara’s name) in 1839, the same year that she married King Willem III. The event scheduled so far that will undoubtedly get the most press is the Duchess of Cambridge's upcoming visit to Malta. Kate's visit, on September 20th and 21st, will be part of the celebrations of the nation's 50th anniversary of independence. But other British royals will also be making international trips. The Earl and Countess of Wessex will be in Canada for an extended tour from September 12-20, and Princess Anne will head to Africa at the end of September, with scheduled trips to Ethiopia and Tanzania. No word yet on whether any foreign heads of state will be visiting Britain this fall, though usually there is an incoming state visit held in October or November. On this day in 1930, a British princess was born. 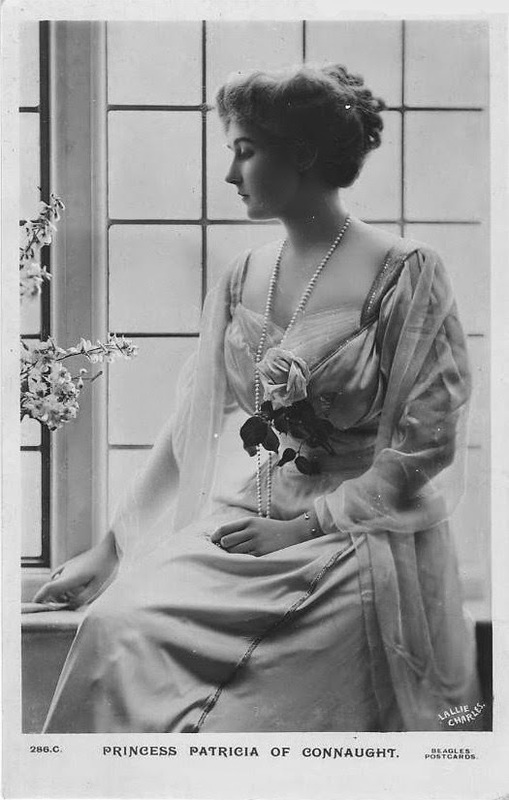 Margaret Rose, the younger daughter of George VI and Elizabeth Bowes-Lyon, made her debut on August 21 at Glamis Castle, one of the ancestral homes of her mother's family. Today would have been her 84th birthday, and in her honor, we're devoting our discussion to the grandest of all her jewels: the Poltimore tiara. If ever there was a tiara match made in heaven, it was Princess Margaret and this whopper of a tiara. The Poltimore, with its floral and scroll elements, may not have been made for Margaret’s swinging ’60s beehive hairdo, but when the two came together, it was tiara kismet. Happy (belated) birthday to Crown Princess Mette-Marit of Norway, who celebrated her 41st birthday yesterday! Mette-Marit, the commoner who found love with her country's future king, has been a part of the Norwegian royal family for thirteen years, and in that time, she's had a chance to attend quite a lot of glittering events. Today, we're looking at the jewels she's worn at gala occasions over the years. Enjoy! On the night before her wedding, Mette-Marit wore major Norwegian heirloom jewels. 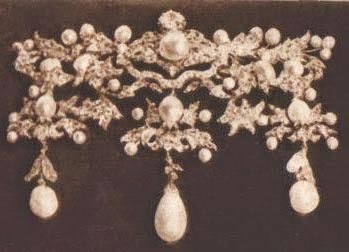 Queen Maud's Vifte Tiara, given to her by Queen Victoria as an eighteenth-birthday present, is worn here as a necklace. Her diamond chandelier earrings also have a sentimental family link. They were King Olav's silver wedding anniversary present to his wife, Crown Princess Märtha -- but sadly, Märtha died before she could wear them. King Harald and Queen Sonja gave the earrings to Mette-Marit as a wedding present. Among the magnificent jewels worn by our Magpie of the Month, Princess Anne, few have as exciting a British royal provenance as her sapphire and diamond brooch. Although some of the details about this piece are murky, it seems very likely that it originates with one of the most influential of her ancestors: Prince Albert, consort to Queen Victoria. Before we get to Anne's brooch, we need to set the stage with a little backstory about the piece that it was supposedly modeled on. 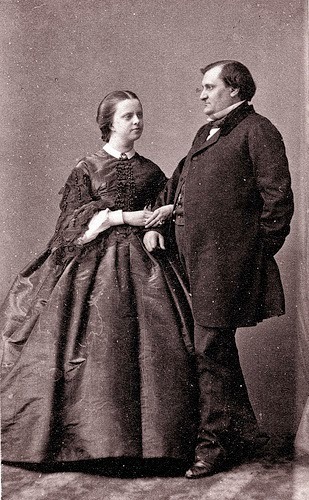 The day before their wedding in 1840, Albert offered a gift to his soon-to-be bride. The bauble, a sapphire and diamond brooch set in gold, was received by Victoria with enthusiasm. In her diary, she noted that Albert had given her "a splendid brooch, a large sapphire set round with diamonds, which is really quite beautiful" . The magnificent diamond tiara and necklace  which the Duchess of Aosta  wore when she appeared in full dress on her recent visit to England are the famous jewels which the Emperor Napoleon  gave to Princess Clotilde  in 1859 on her marriage, and they were worth a good fortune. 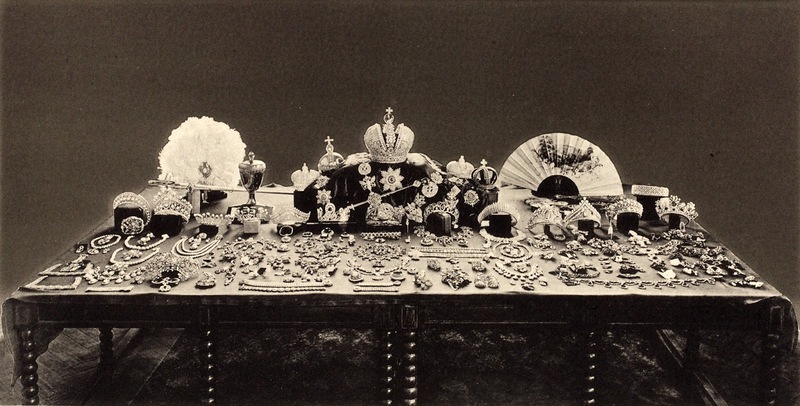 When Princess Clotilde fled to Italy in September 1870, she took these jewels with her, and placed them in charge of King Victor Emmanuel , who peremptorily refused to give them up to Prince Napoleon, who was anxious to convert them into money; but he never succeeded at recapturing them, although he frequently attempted to do so. The Duchess of Aosta left Paris on Saturday for Moncalieri, near Turin, on a visit to her mother, Princess Clotilde. Can you identify the jewels worn by the Countess of Paris at the wedding of her daughter, Princess Chantal d'Orleans, in 1972? With a name like “the Habsburg Fringe Tiara,” you’d be forgiven for thinking that this tiara was a part of the collection of the former imperial family of Austria. But this particular fringe belongs to another group of royals -- the princely family of Liechtenstein. Since yesterday was the tiny principality's national day, let's have a look at their imperial tiara, shall we? As with many diadems created for the women of the Habsburg family, this tiara was made in Vienna by Köchert, the family's court jeweler. It was made around 1890, during the reign of Emperor Franz Joseph I. The tiara was made in a very popular contemporary style, mimicking the diamond fringe tiaras worn at the court of the Romanovs in Russia. The halo-shape of these fringe tiaras is meant to mimic the kokoshnik headdresses worn by Russian women. (See my post on kokoshniks for a whole lot more on that!) Luxarazzi, which covers the Liechtenstein princely family as well as the royals of Luxembourg, notes that the tiara is made of "diamonds set in silver and gold." Like most fringe tiaras, this one can reportedly be converted to a necklace. The royals are firmly in vacation-mode right now, readers, so I'm postponing our weekly jewel news post until there's actually some jewel news to share! Instead, today we're celebrating the birthday of our Magpie of the Month, Princess Anne. Enjoy! When your mother is one of the most powerful women in the world, you're going to have a few glittering events to attend. Anne Elizabeth Alice Louise, the second child and only daughter of Queen Elizabeth II and Prince Philip, was born on this day in 1950. To celebrate the Princess Royal's birthday, let's have a look at some of the jewelry she's worn to galas and banquets during her royal life so far. 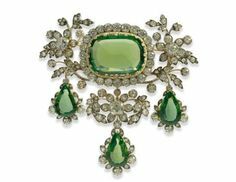 Our focus today is a true royal rarity: a diamond parure that also includes a generous helping of peridot, the birthstone of all of you August babies. What could make it better? Why, a provenance that connects it with the Habsburgs, surely! 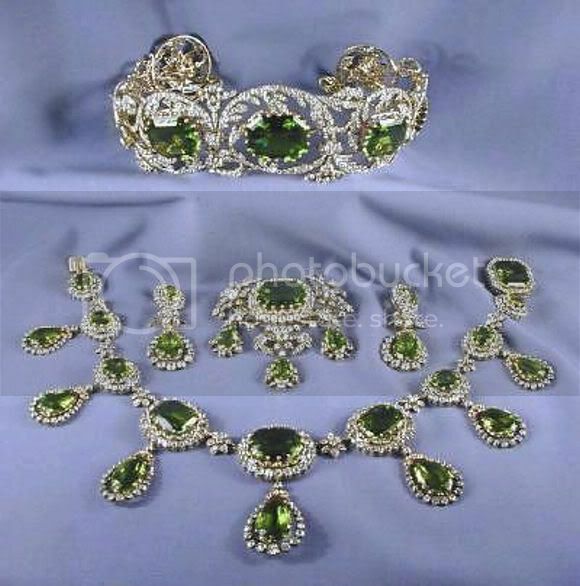 The set in question is a complete parure of peridot jewels: a tiara, a necklace, earrings, and a substantial brooch. 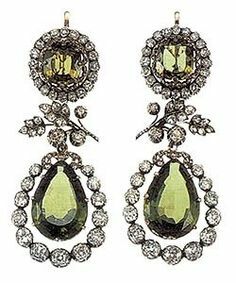 The parure dates to about 1825 and has been attributed to Köchert, who would later become the imperial court jewelers to the Habsburgs. 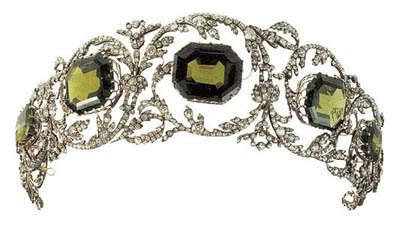 The tiara features large diamond scrolls, the center of which are studded with absolutely enormous peridots. 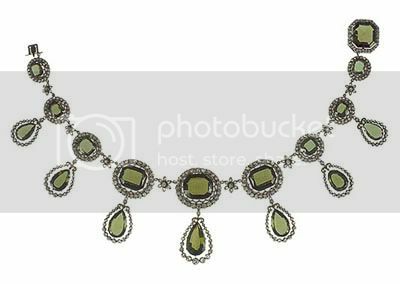 Moreover, the tiara can also be supplemented with seven of the pendants from the necklace, which can be set upright atop the piece. A delicate floral motif runs through all of the pieces in the parure, including the pair of pendant earrings and the large devant de corsage. With many of the royals of Europe are on vacation, I've decided to take a minute to remember the remarkable jewels and style of Lauren Bacall, who died yesterday at the age of 89. Bacall was one of my favorite actresses -- if you haven't seen How to Marry a Millionaire, drop everything right this minute and put it in your Netflix queue! Like many of the Hollywood icons of her era, Bacall also wore jewels in a truly elegant way. She so loved jewels that she even helped to produce her own jewelry line, Bacall, in the 2000s. Here are a few of my favorite photos of a bejeweled Bacall -- and then, seriously, go watch one of her films! Although the principality of Monaco is one of the smallest nations in the world, it has royal traditions that are just as rich as those of much larger monarchies. Today, we're chatting about the highest order of chivalry in the country: the Order of Saint-Charles, which was established more than 150 years ago. The order was founded on 15 March 1858, during the first years of the reign of Charles III of Monaco. The new order wasn't Charles's most lasting legacy -- that would be the casino at Monte Carlo. But while the casino is named after Charles III, the order is named after a different Charles: St. Charles Borromeo. Of all of Princess Anne's jewelry, the piece with maybe the best historical provenance is today's jewel: the diamond and pearl choker with a geometric sapphire and diamond clasp. It may be worn today by a British princess, but it has Romanov roots. 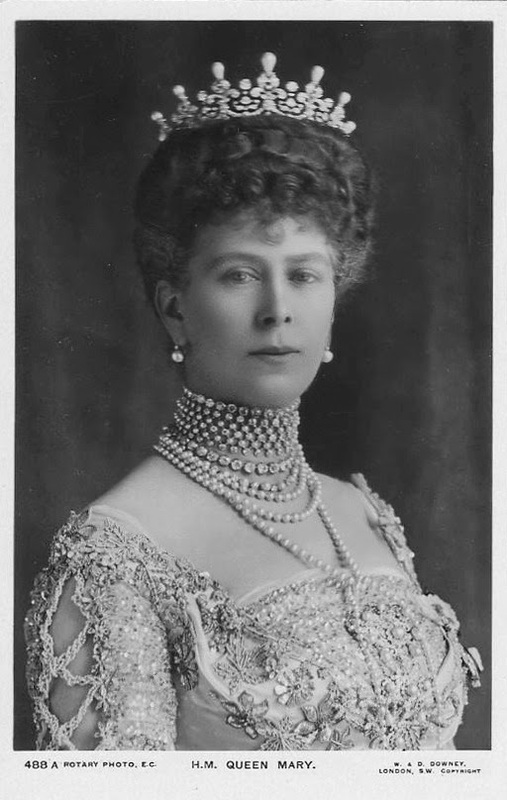 The choker is one of the pieces that Queen Mary purchased from the estate of the late Empress Marie Feodorovna. 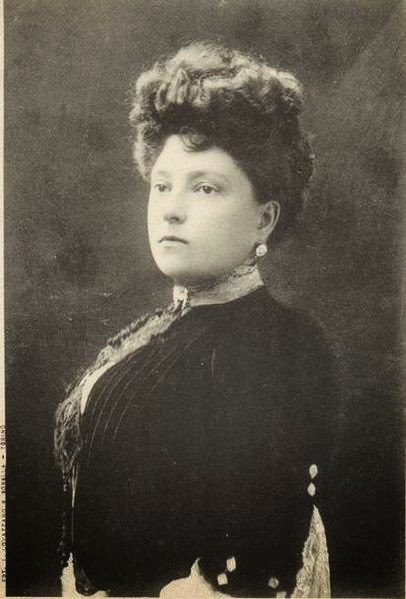 Minnie was the daughter, sister, wife, and mother of monarchs; she was a Danish princess who was married to Tsar Alexander III of Russia. As you can imagine, her jewel collection was extensive, and it included a number of sapphire pieces, among them the parure depicted in the 1874 portrait above. 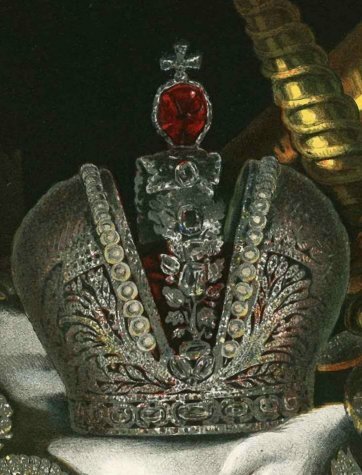 I've seen speculation that the sapphire in the choker's clasp came from this set, but I'm not sure that such a suggestion could ever really be fully explored, given the fate of the majority of the Romanov jewels. Can you identify the jewels worn by Sarah Ferguson, then HRH The Duchess of York, during her 1987 tour of Canada? There are British royal tiaras, and then there are, well, British royal tiaras. We've looked at lots of sparklers from the Windsor royal vaults, but today, we're going to marvel at a tiara from another British family with royal roots: the Mountbattens. Descended from Queen Victoria's daughter Alice -- and brought to prominence in Britain again when Alice's great-grandson, Prince Philip, married the future Elizabeth II in 1947 -- the Mountbatten clan has owned several tiaras over the past century, including today's diamond star tiara. Princess Alice left Britain when she married Grand Duke Louis IV of Hesse and by Rhine; she died before their daughter, Princess Victoria of Hesse, married Prince Louis of Battenberg in 1884. As a wedding present, Queen Victoria gave her granddaughter a pair of hairpins that featured diamond stars set with a central pearl. (See Ursula's website for more). 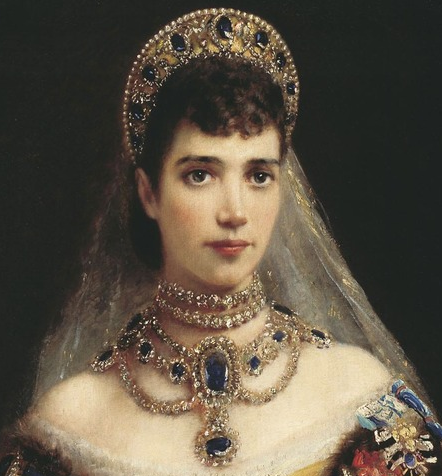 Apparently, the younger Victoria had these diamond stars incorporated into a star tiara. 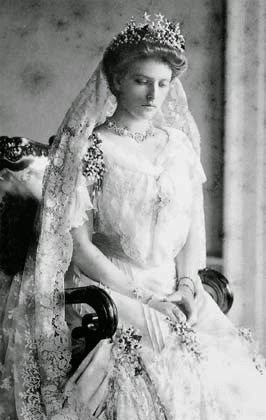 Sources suggest that this was the same tiara that Princess Victoria’s daughter, Princess Alice of Battenberg, wore to marry Prince Andrew of Greece and Denmark in 1903 (pictured above -- the stars are visible above the flowers in Alice's hair). This week, we're surveying the jewels worn by royal ladies during the events held to remember the beginning of World War I. A little sparkle was worn, but much of it was either subdued or connected to the events themselves. 5. On Monday, the Duchess of Cambridge traveled to Belgium to take part in events to mark the centenary of the start of the war. For the day's commemorations, Kate wore a familiar pair of drop pearl earrings. Pearls and other "white" jewels are fairly commonly worn for events that have a somber or mournful element to them, like this week's services, which remembered the sacrifice and loss of the war while underscoring the importance of peace and cooperation. 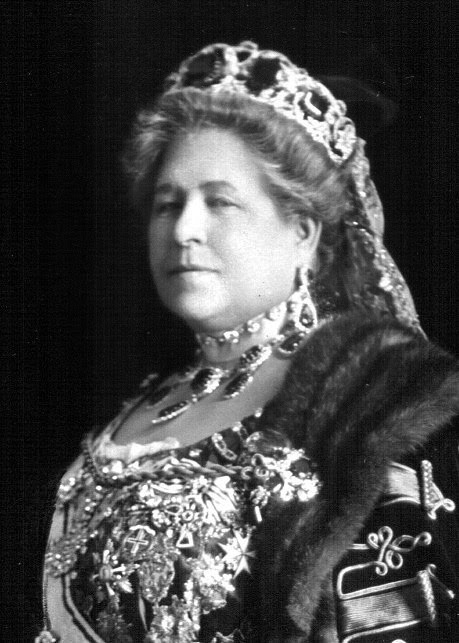 After a post on Queen Mary's jewelry innovations, it's only fair to let all of you have another crack at re-imagining a piece of royal jewelry! If you could rework the emerald art deco tiara from the Luxembourg collection, set in platinum by Chaumet and featuring an enormous cabochon emerald stone, what changes would you make? "Her Majesty Has Diamonds Reset"
Queen Mary has lately sent some of her wonderful collection of diamonds to be reset, and this serves to confirm what was said at the time of the coronation -- that these are Her Majesty's favorite gems. Though she possesses some very valuable rubies, emeralds, and pearls, she rarely wears them, and as a rule diamonds form her sole ornament. 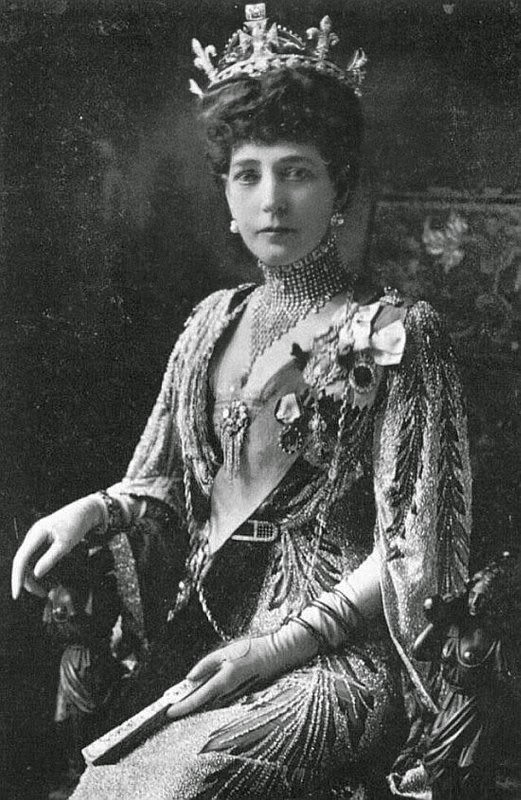 Queen Alexandra, on the other hand, greatly prefers to have her diamonds mixed with other stones, particularly emeralds and amethysts. Emeralds are the favorite stones of the Duchess of Connaught, while her daughter, Princess Patricia, confessed to a preference for turquoises. Can you identify the jewels worn in this 1960s-era photograph by Farah Pahlavi, the former empress of Iran? We've been talking quite a lot recently about the Norwegian royal jewels with British connections. Today, we've got yet another example: the Maltese Cross Tiara. It belonged to Queen Alexandra, whose daughter, Princess Maud, became queen of Norway in 1905. Trond Norén Isaksen notes that Alexandra had the diamond circlet made as a lighter alternative to the George IV State Diadem, which is still worn today by Queen Elizabeth II. Here’s Alexandra in the simpler diamond circlet (with Queen Victoria’s small diamond crown placed inside). The tiara takes its name from the Maltese crosses that are placed atop its bandeau base. As you can see in the photo of Alexandra, the circlet originally also had four fleur-de-lys elements situated between the Maltese crosses. It also was originally able to take the Cullinan VI stone, though that diamond was never permanently incorporated into the piece.